NORTHBROOK, Ill.--(BUSINESS WIRE)--Marathon Pharmaceuticals, LLC today announced the availability of ZiNGO® (lidocaine hydrochloride monohydrate, 0.5 mg) powder intradermal injection system, a needle-free, easy to use device to deliver a topical local anesthetic to manage venous access pain in as little as one to three minutes. ZiNGO® is a hand-held device that, with the push of a button, delivers a 0.5 mg dose of powdered lidocaine particles into the skin via a helium-powered delivery system, numbing the site in one to three minutes. This rapid onset means the product can be incorporated into a medical procedure requiring venous access, allowing uninterrupted care. ZiNGO® is sterile, for single-use and does not need to be refrigerated. IV cannulations are one of the worst sources of pain for children in pediatric hospitals i,ii, and the anxiety associated with needles often requires children to be restrained for blood draws and IV starts iii. ZiNGO® provides relief for these patients by delivering a powdered form of lidocaine that numbs the site prior to needle insertion. “ZiNGO® is the first easy-to-administer, fast-acting topical local anesthetic that could lead to a paradigm shift in the approach to venous access procedures in children,” said William T. Zempsky, MD, Professor of Pediatrics and Division Head of Pain and Palliative Medicine at Connecticut Children’s Medical Center, who led pediatric clinical trials of ZiNGO®. “Because commonly available local anesthetic products can take up to 30 to 60 minutes to work, making incorporation into the busy healthcare environment difficult, healthcare providers have had to sacrifice patient comfort when performing the numerous venous access procedures that occur each day. ZiNGO® will be a source of relief to children and parents,” Zempsky explained. Marathon will initially focus on providing ZiNGO® to children’s hospitals, medical centers and community hospitals. “We recognize the high demands on clinicians caring for patients. ZiNGO® has an onset of action in as little as one to three minutes, enabling nurses to reduce pain at the needle insertion site easily and efficiently in the busy hospital setting,” said Tom Larson, Vice President, Commercial Operations. 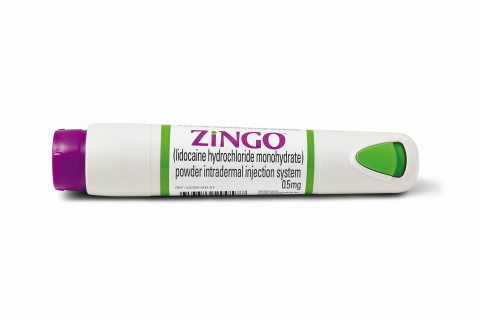 ZiNGO® is indicated for use on intact skin to provide topical local analgesia prior to venipuncture or peripheral intravenous cannulation in children 3-18 years of age. ZiNGO® is indicated for use on intact skin to provide topical local analgesia prior to venipuncture in adults. Zingo® is contraindicated in patients with a known history of sensitivity to local anesthetics of the amide type. It is for external use only and not to be used around the eyes or on body orifices, mucous membranes, or on areas with a compromised skin barrier. Zingo® should only be used on skin locations where an adequate seal can be maintained. Do not use if the device is dropped or the pouch is damaged or torn. Patients with severe hepatic disease or pseudocholinesterase deficiency, because of their inability to metabolize local anesthetics normally, are at a greater risk of developing toxic plasma concentrations of lidocaine. Patients with bleeding tendencies or platelet disorders could have a higher risk of superficial dermal bleeding. The most common adverse reactions (˃5%) observed in clinical studies included skin reactions at the site of administration: erythema, petechiae, edema, and pruritus. Most adverse reactions in the Zingo® adult clinical studies were application-site related [i.e., hypoaesthesia (0% active treated subjects vs. 0.5% sham-placebo device), burning (0.5% active treated subjects vs. 0.4% sham-placebo device), and venipuncture site hemorrhage (0.4% active treated subjects vs. 1.7% sham-placebo device)] and the most common systemic adverse reaction was dizziness (0.9% of active treated subjects vs. 0.7% sham-placebo device). Most adverse reactions in the Zingo® pediatric clinical studies were application-site reactions (i.e., bruising, burning, pain, contusion, hemorrhage) , occurring in 4% of the patients in each treatment group and the most common systemic adverse reactions were nausea (2%) and vomiting (1%). Click here to: See Full Prescribing Information. Marathon Pharmaceuticals, LLC today announced the availability of ZiNGO® powder intradermal injection system, a needle-free, easy to use device to manage venous access pain.